Writer-director Takashi Miike, the master of gory violence, is in altogether more sombre mood with his remake of Masaki Kobayashi's iconic 1962 feature "Harakiri". Takashi Miike's film takes the form of a highly formally controlled, slow-paced, beautifully depicted tragedy. The form is particularly complex and satisfying - a tale within a tale within a tale, book-ended by acts of wince-inducingly graphic and stunningly choreographed violence. It is both a personal, family tragedy, and a lament for the unbearable burden that the honour code of the samurai places on its follower. 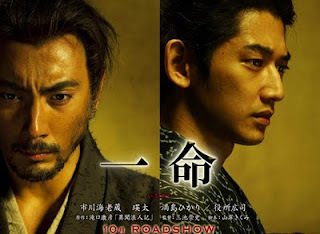 The movie is set in seventeenth century Edo, where peace has left the samurai caste impoverished and unemployed. The desperate ronin (samurai without master) apply to local lords to commit ritual suicide in their courtyards "to restore honour", but hoping the lords will pay them to leave. As the film opens, Hanshiro Tsugumo (Ebizo Ichikawa) is making just such an application and the Senior Retainer warns him not bluff this particular house. This is the outer layer of the story. The retainer tells the tale of the previous applicant, Motomo Chijiwa (Eita) whose bluff was called. The second layer of the tale. And then, we get to the very heart of the film, Tsugamo's reply to the Retainer, which reveals that he knew Chijiwa well. In fact, the boy was his son-in-law - husband to an ailing wife and son, desperate for a few pennies for medicine. In the telling of the three tales, Takashi Miike depicts with unflinching gaze the truth behind the exotic myth of the samurai - that their fortunes are swept up in wider feudal conflicts - a knife-edge walk between poverty and glory - the lack of humanity in their strict honour code. This is done not just through the graphic depiction of ritual suicide, but more subtly in the colour palette of the film. The reality of life is depicted in shades of grey. Real life is dark, unlit, unwarmed, grim and bleak. This contrasts with the burnished red coat of armour lovingly given pride of place in the courtyard - the only shock of colour in the film, constantly in the glow of candles. It's as though society has been up-ended, inverted - and the prison-like samurai code is being given the upper hand over life itself. HARA-KIRI: DEATH OF SAMURAI is an amazing film. Moving, never melodramatic despite the tragedy, formally beautiful, with set pieces that are unbearably tense and vividly depicted. It is not the typical film one has come to expect from Takashi Miike and his long-time fans may be disappointed at its serious, almost lyrical tone. But I found it to be his best, most mature, most artistic work to date. The only quibble is that the 3D adds very little to the experience. HARA-KIRI: DEATH OF A SAMURAI played Cannes 2011 where it was the first film to be shown in 3D. It opened in Japan on October 15th and opens in France on November 30th.